This product is cool roofing at its best. It features proprietary granules that may cut down your energy costs up to 7% to 15%. Compared with traditional shingles, it reflects most of incoming sun rays and re-emits the absorbed portion quickly. As a result, it transfers less heat to the rest of your home and then reduces your need to air-condition our interior spaces. Cool Series shingles don’t need white granules to be highly reflective. GAF uses unique formulas to coat them with different color blends and meet your aesthetic needs. 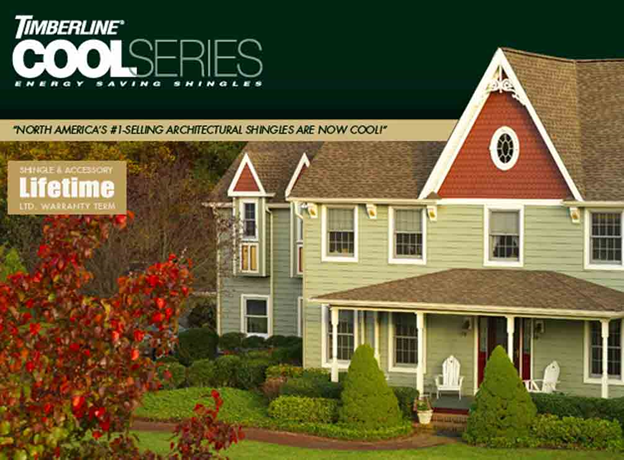 The Timberline Cool Series Shingles keep both your home and community cool. It helps prevent the surrounding air from overheating, making your city less of a heat island. With a cooler environment, the formation of smog slows down. This results in a healthier environment. Long periods of heat exposure from the sun accelerate roof failures, which can lead to premature replacement. With Cool Series shingles, your Westchester roofing system can maintain a constant temperature. This reduces thermal shock and adds more years to the system. Just like other GAF products, the Timberline Cool Series features innovative technologies to withstand the test of time without aging. The Advanced Protection® Technology makes it tough enough to resist whatever Mother Nature throws at it. The StainGuard® Protection safeguards it from the unsightly blue-green algae growth, while it’s not susceptible to blow-offs because of its Dura Grip™ Adhesive seals. Invest in highly reflective shingles for your new Norwalk roofing system for a more energy savings and better indoor comfort. Call Vinylume today at (866) 244-8029 today to set your FREE in-home consultation.